As it turns out (and I’m sure this will surprise no one) South East Alaska is beautiful beyond words. I have never been to Alaska before, and had no real notions of what to expend beyond “kind of like Maine but bigger, and no lobsters”, which is fair, though a bit of an understatement. South East Alaska is a temperate rainforest, with snow-capped mountains continuing to the waters edge. And there are glaciers. And icebergs. And sea otters - a group of which is properly called a “raft” and when they are not in a hurry their preferred mode of locomotion is to roll on their backs and paddle with their hind feet while they rest their front paws on their chests to better watch whatever they are twiddling away from. Thanks to the sea otters, there are also giant kelp forests (because the sea otters eat sea urchin and sea stars, both of which are such aggressive eaters of sea weeds that without the sea otters to keep their population in check, they eat the sea floor clean). The giant kelp occasionally breaks free of the bottom, floating free in giant rafts of its own, parts of which occasionally get sucked into our various sea water systems (for flushing the toilets, or cooling the engines) which means that I am cleaning sea strainers more often than I would like, so in a grand, ecologically connected way, the presence of sea otters is actually making my life a little more difficult, but I love them anyway. 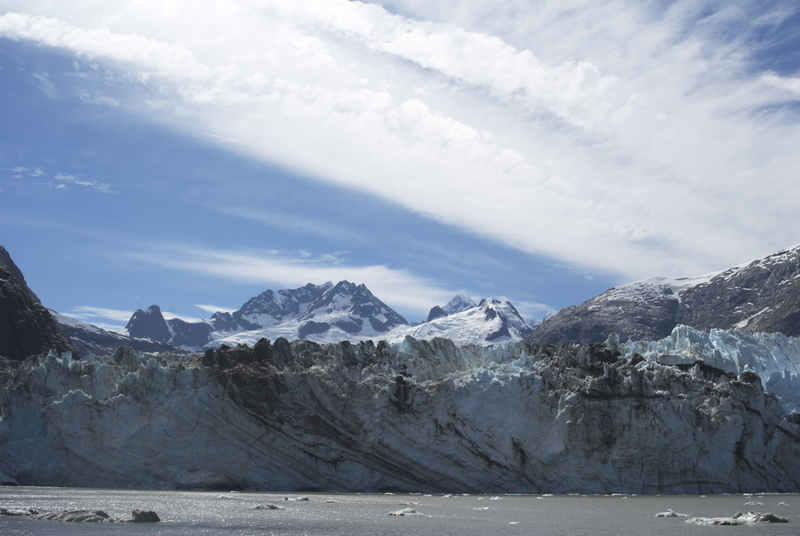 Once a week we motor up into Glacier Bay to spy on mountain goats and glaciers. Yesterday was Glacier Bay Day. In the afternoon, whilst fixing a door handle, I was nearly overwhelmed by a perfect moment of really loving my day job. I had all the parts I needed to fix the door (not always the case on a boat with a zillion different parts, potentially sourced from hardware stores in five countries). And when I peered around the door, this was my view. Now this is a lovely view, but it pails in comparison to where we had been earlier in the day. After lunch we noodled up to Johns Hopkins Glacier. In the ice fields at the base of the glacier we saw seals sunning themselves on the icebergs (in a stunning show of poor decision making, I failed to pack my zoom lens on this rotation – so you have to squint a bit, and trust me that those darker blobs are indeed a large number of seals). 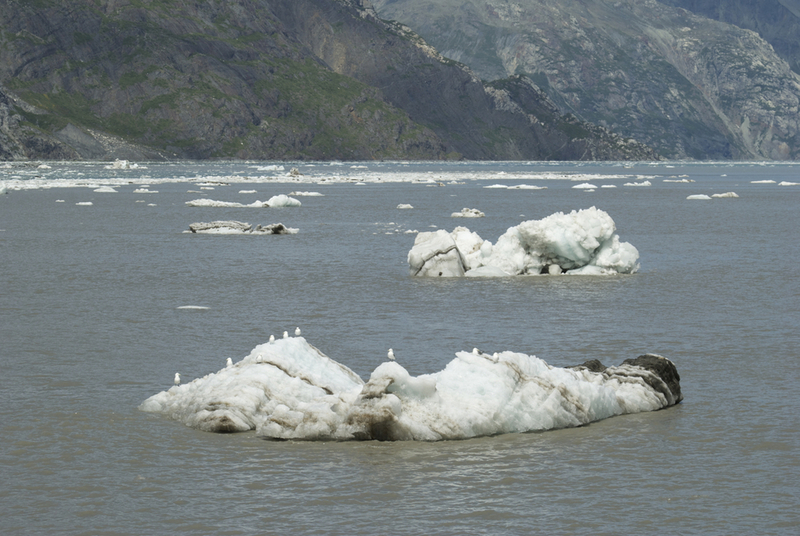 Sea birds (I think these might be kittywakes) also took advantage of the icebergs. And then closer to the glacier we had a stunning view of this fine mountain, sporting its own fine glacier. And on a very silly note, last week the Stews (short for “stewards” or more often “stewardesses”, they wait tables and clean guest cabins, and in the absence of ships officers, are in charge of life rafts) had a girl night (invitation not exclusive to girls - basically the idea was mud mask, nail painting, and giggling over attractive members of one's preferred gender). One of them painted my nails. I think they came out quite well.